Chocolate truffles are the delicious treats that are made of a ganache center and are covered with white or dark chocolate. Chocolate truffles are very popular among chocolate lovers, because they flood your mouth with an unforgettable taste. Truffles are known to be at the top of all self-indulging delicacies. They have remained the most admired chocolate candies in Italy, France, North America, Switzerland, and other parts of Western Europe for more than a hundred years. They can be easily made at home and can also be beautified with different types of coatings, such as coconut, nuts, confectioner's sugar, etc. They are best when given as a Valentine's day gift. If you are planning to have a party at your home and you want the guests to remember your party forever, you are recommended to go for chocolate truffles. Truffles will not only look nice on the table, but will also leave a never lasting impression on your guests with their amazing taste. They are so much popular in parties and as gifts that you will find a wide variety of chocolate truffle recipes on internet. By following any of these easy recipes, you can prepare truffles according to the occasion you will be serving them on. 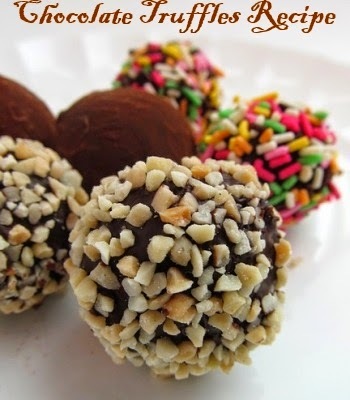 Below is an easy recipe for you to prepare yummy chocolate truffles at home, so you can make your loved ones go crazy about your choice in desserts. You will start by taking a big sized bowl to beat the cream cheese in it. Add the icing sugar, while you are beating the cream cheese. Make sure that they are both blended perfectly. Add this structure to the melted chocolate. Mix these and while mixing, add the vanilla extract. Refrigerate this structure for about one and half hour and then form it into various balls. The size of your truffles depends on your choice, but make sure that they are not more than one or two bites. To make them more appealing, you can roll your truffles in any type of coating that you like. You can coat your truffles in icing sugar, crushed nuts, cinnamon, cocoa, candy canes, etc. For coating, do consider the choice of your family members too.